Distinguished members of the Indian business community, Honourable Ministers, Ladies and gentlemen, Your Excellency, Ram Nath Kovind, President of the Republic of India, First Lady Madam Savita Kovind, Honourable Ministers, Distinguished Guests, Ladies and Gentlemen. Allow me at the outset to express my sincere appreciation to President Kovind for his kind words addressed to me and my delegation. Fazna and I are deeply touched by the very gracious hospitality, and the splendid arrangements that have been made for us and my delegation during this visit. Fazna and I have a personal affinity for India; twenty-six years ago, we took our marriage vows in this wonderful country of yours. It is an honour to be hosted at this magnificent residence, Rashtrapati Bhavan. Its combination of Edwardian and Indian architectural styles is a fine testament to India’s long cherished principle of unity through diversity. More than 70 years ago, in this great city, a great Indian, Prime Minister Jawaharlal Nehru spoke of India’s tryst with destiny; of how a nation long suppressed found its voice; of how it stepped out from the old into the new. These words hold special significance for us, as we re-embark on our democratic journey. Tonight, we gather here, to celebrate the ties that bind the Maldives with India. Ours is a long friendship that is ancient beyond memory. Trade and commerce, cultural exchanges and the movement of peoples between our two countries have continued for millennia. Things are no different today. 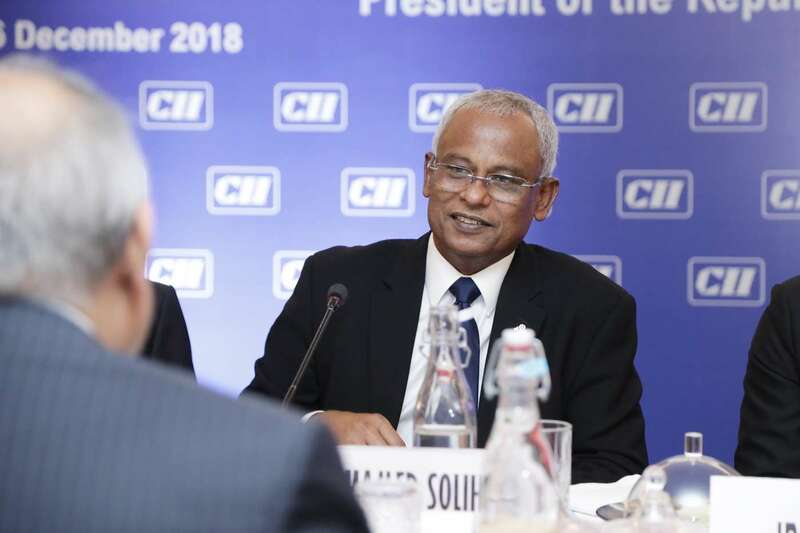 India remains one of our largest trading partners; hundreds of Maldivians travel to India for a multitude of purposes, from health care and education, to tourism. Indian culture, most notably its cinema and music, have a huge following amongst Maldivians. We also take heart in the fact that India is the world’s largest democracy and has served as a beacon of hope, and a source of inspiration for freedom loving peoples everywhere. As many here would know, our journey towards democracy had in recent years faced many challenges. Basic rights of citizens were stifled; the press was silenced; opposition politicians were systematically jailed; and there was the real possibility of the Maldives irreversibly sliding into authoritarian rule once again. The repercussions of this autocratic wave was not merely domestic, but also had implications for the peace, security and stability of our South Asian region. The previous administration, turned its back on old friends; and embarked on a dangerous game of geopolitical chess as it turned it back on time-tested friends who had consistently stood by us in times of our every need. We are starting anew. We want to be an upstanding member of the society of states- a good international citizen. We want to rekindle old friendships while fostering new ones. Which is why, at this gathering, I’m once again re-affirming my government’s commitment to maintaining and strengthening the close and fraternal ties between our two countries. It is said that good friends are those who show up in trying times; And it is an undeniable fact - India has always shown up whenever the Maldives was in need. India is an important development partner, and one with whom we share a vision of a more prosperous, stable and democratic South Asia. My government and I look forward to working with India towards realizing these goals. I am happy to note that during this visit, we have been able to make important progress in our bilateral relationship. We have strengthened our people-to-people contact, with the newly signed Agreement on Visa Facilitation. We have exchanged ideas on promoting investment, enhancing private sector ties. We have expanded our cooperation in health, education, cultural cooperation, ICT development. But more importantly, we have once again, reaffirmed our commitment to a new era of cooperation between our two countries. On behalf of the Maldivian people, may I ask you, Excellency, to convey their message of goodwill, peace and prosperity to their fraternal friends, the people of India. And may I also take this opportunity to invite Your Excellency and Madam, to undertake a visit to our beautiful island paradise in the near future.